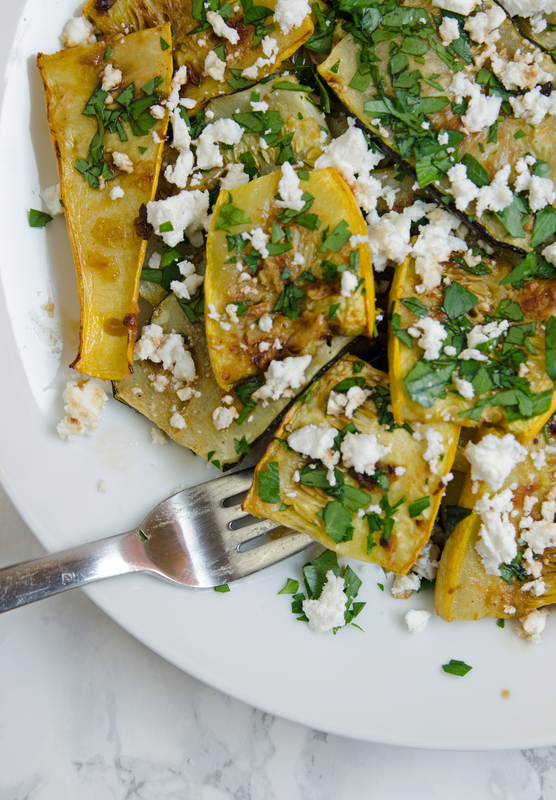 Roasting vegetables is super easy and super healthy, especially yellow squash and zucchini. In the winter, I oven roast vegetables and in the summer I grill them. Either way, they are easy and delicious. Squash is a versatile vegetable because it can be eaten warm or cold or at room temperature. This Summer Squash Salad uses the best of garden fresh summer squashes, yellow and zucchini, for a low in calorie and big in flavor salad. 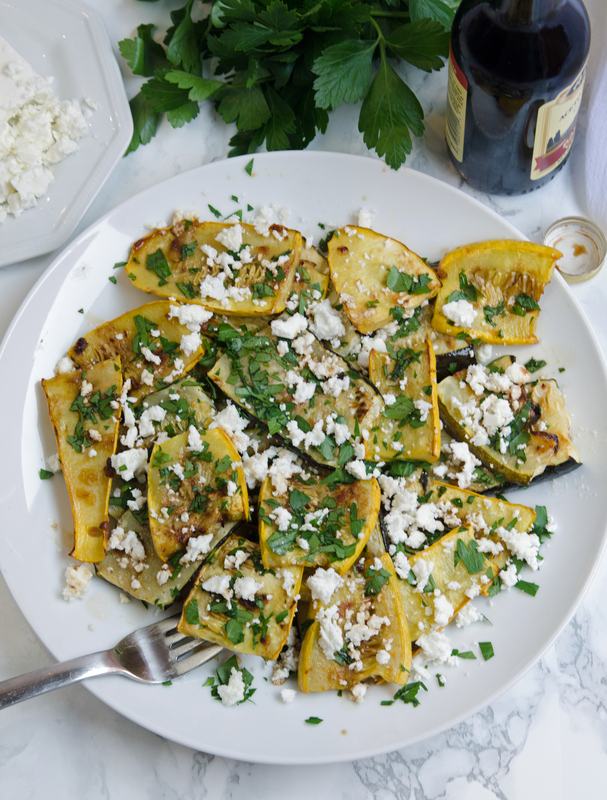 It uses tangy balsamic, creamy feta and fresh parsley to enhance the subtle flavors of the squash. The result, a salad you’ll be craving all year long. Cut the summer squash and zucchini 1/4-slices and bell peppers into 1″ slices. In a small bowl combine olive oil, mustard, apple cider vinegar, garlic, salt, and pepper. Place all the cut vegetables in a single layer on 2 baking sheets. Drizzle vegetable with olive oil and mustard dressing. Bake for 25 to 35 minutes, until all the vegetables are tender, turning once with a metal spatula. Or, place on a hot grill on indirect heat. Cook on each side for 1-2 minutes until soft. Drizzle with balsamic vinegar. Sprinkle with feta cheese and parsley. Season to taste. This dish can be served hot or cold. This recipe was originally published on March 26, 2013. It was updated for accuracy in July 2018.